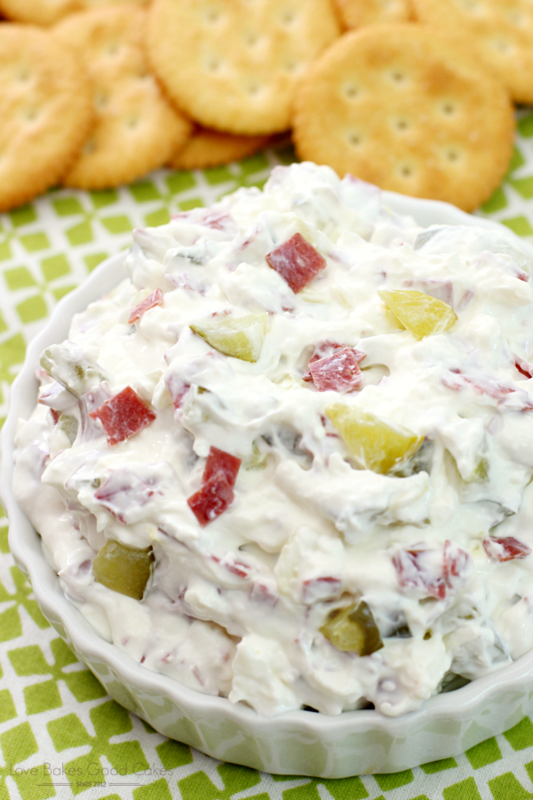 The classic Dill Pickle Wraps you love – in an easier to make, but just as delicious dip! 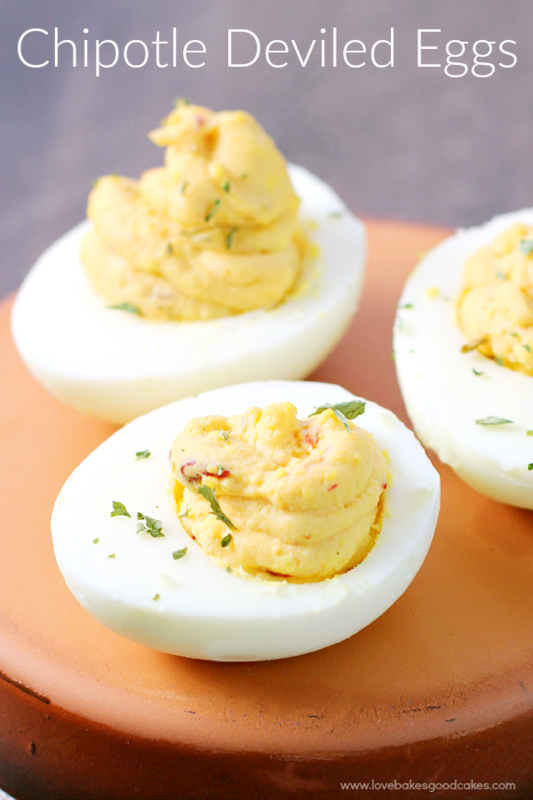 With only 4 ingredients and less than 10 minutes to make, this will be your go-to appetizer! Are you ready for football season?! It seems like we’ve been waiting forever and it’s finally here!! Finally! Now that my oldest son and his wife live here in the Phoenix area, I am a little more excited because he is really into football and I love giving him a hard time about his team! (They’re the ones who had the “deflategate” incident!!) You know the jokes just write themselves after that fiasco! Growing up, my mom made the traditional Dill Pickle Wraps – and I absolutely LOVED them. It wasn’t something we had very often, but oh, how I loved them when we did have them! 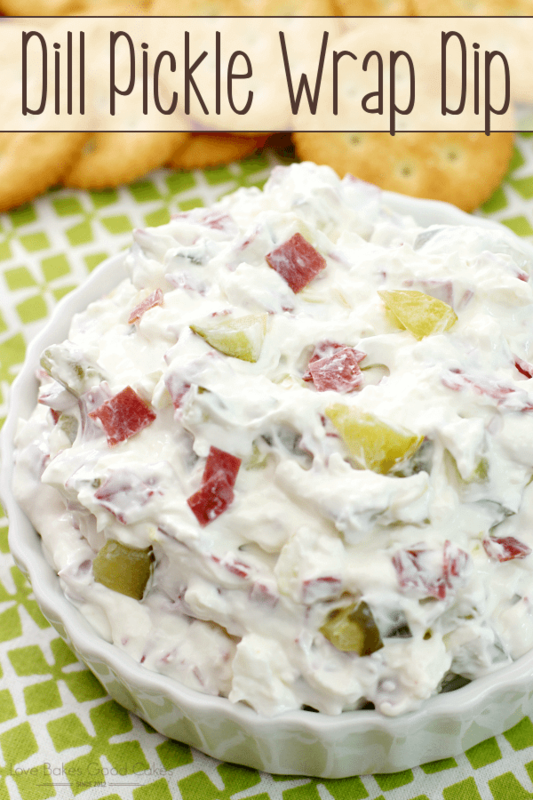 This Dill Pickle Wrap Dip has all of the same flavors, but in my opinion, it is sooooo much easier and less messy to make! 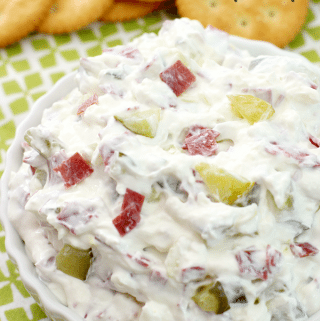 It’s one of the things I love to put out when we have family and friends over because people remember those tasty little Dill Pickle Wraps and love the idea of making it into a dip! You can bet that this dip is always one of the first things to go! Elijah’s team will be playing the Bird Gang in about two weeks. Since it’ll be a local game – you can bet we’ll both be watching! 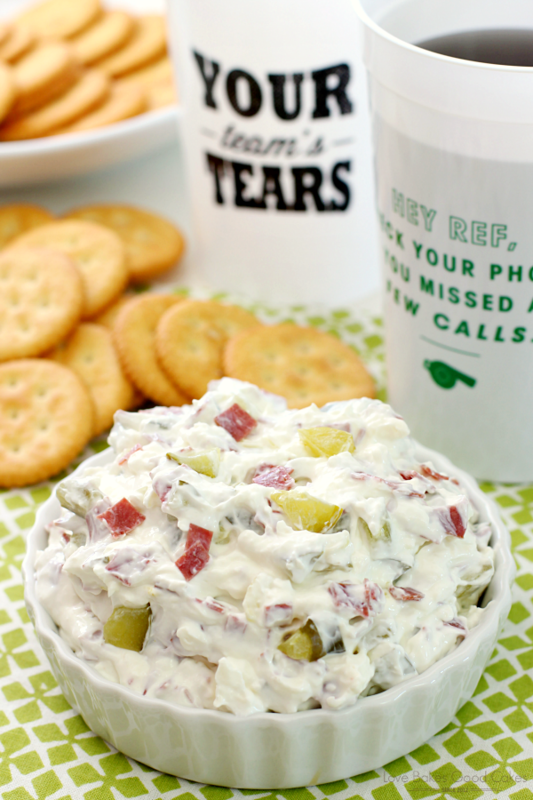 Of course, this Dill Pickle Wrap Dip will definitely be on the table along with some of our other favorite game day grub! 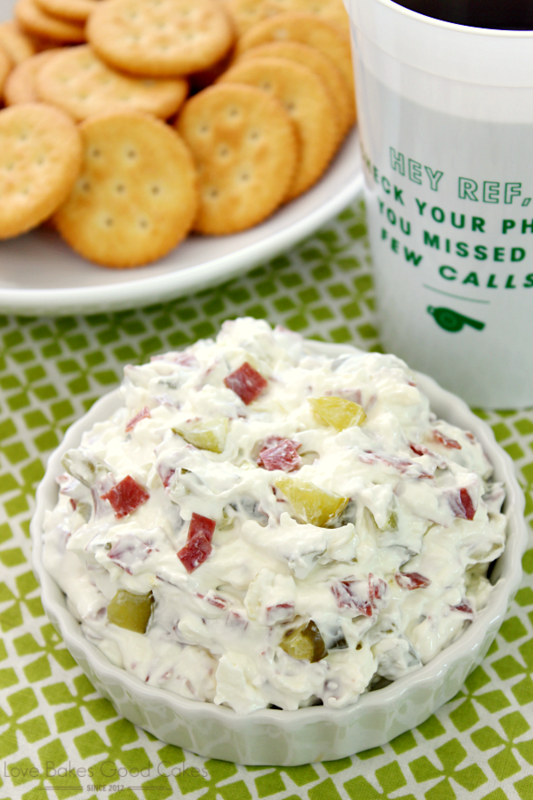 This Dill Pickle Wrap Dip isn’t just for football season – that would be foolish to limit it’s potential!! Enjoy this delicious and easy appetizer on your holiday table. At birthday parties. 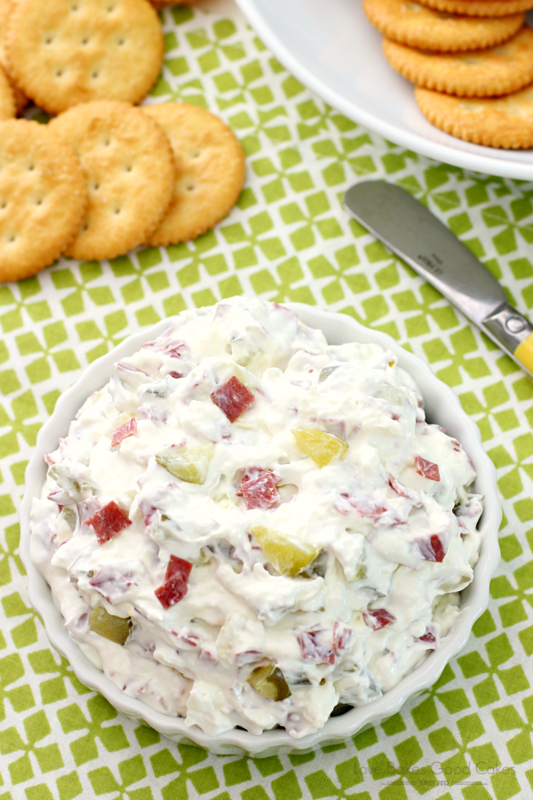 It’s great for cookouts, potlucks, or anytime you need a simple dish that people will LOVE. And love it, they will! Note – I have also seen the traditional dill pickle wraps made with ham – and if you prefer it made that way, feel free to substitute thinly sliced ham for the dried beef in the recipe! Enjoy! 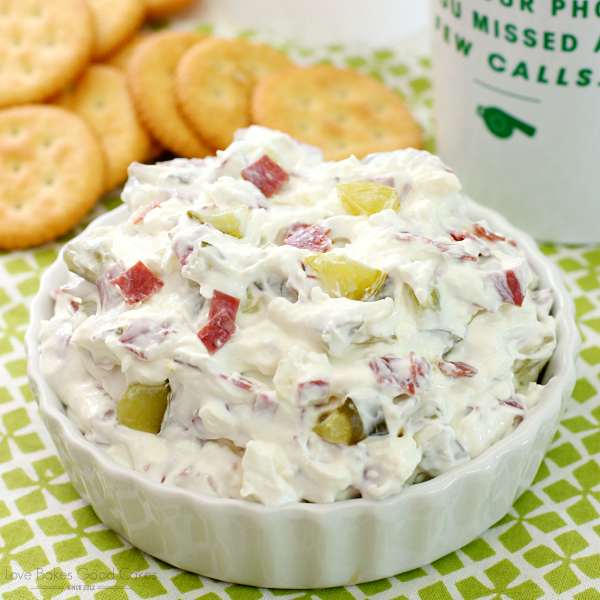 The classic Dill Pickle Wraps you love - in an easier to make, but just as delicious dip! 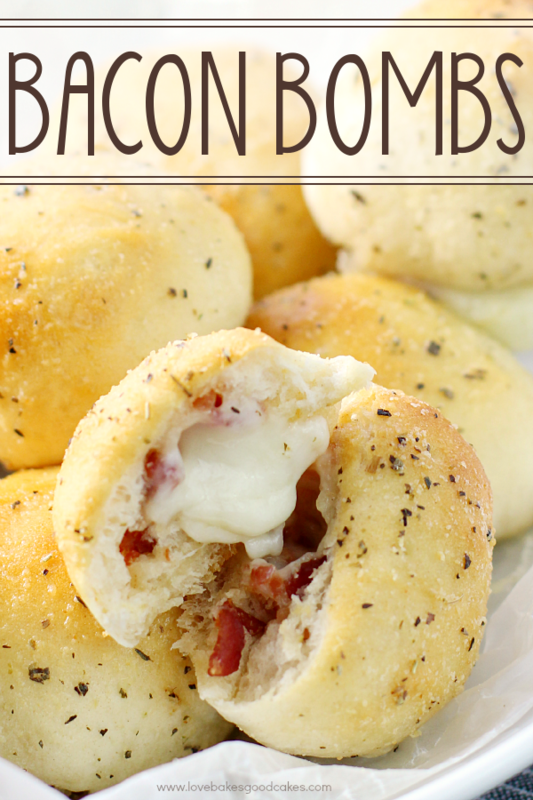 With only 4 ingredients and less than 10 minutes to make, this will be your go-to appetizer! In a medium mixing bowl, beat cream cheese with an electric mixer until smooth. Add the sour cream and beat until smooth. Stir in pickles and beef. Cover and chill in refrigerator at least 2 hours before serving. Serve with crackers or fresh vegetables. My mother-in-law loves those pickle wraps, but they are a bit of work to make. This would be a great way to get those flavors in a hurry. I am definitely making this one of these Sundays! This dill pickle wrap looks so good. I have to make it! I will totally make this dip it sounds awesome! Oh and your son is probably so sad that his team lost the big game to the Eagles .Proud Eagles Super Bowl Champions fan.